Check it out! Connect 4 is back! This time, launch your way to victory. This game is mega fun if you are into fast-paced winning! This game definitely gets my adrenaline pumping. This is a classic game of four-in-a-row but with a new fast-flying, frenetic pace. 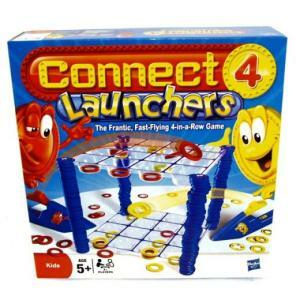 Two to four players are a must to engage in a head-to-head race as you try to aim, launch, and connect your way to victory. Features a new horizontal game unit to catch the launched checkers. There are three ways to play: Basic Frantic Launch, Championship Frantic Launch, and Advanced Power Launch. Perfect for a family game night! Available at mass merchandise retailers nationwide and on Hasbro.com.